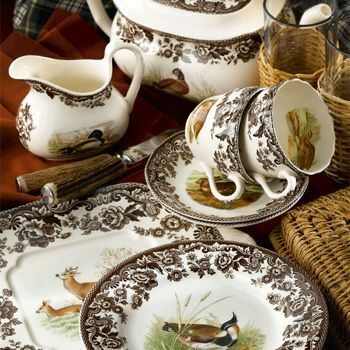 Spode's Woodland pattern features fine studies of British game animals framed by a stylized floral border. This beautiful range perfectly encapsulates country living and is evocative of English country pursuits, bringing a unique theme to any home. The border of "British Flowers" dating from c1828 effortlessly complements each scene. To add to the appeal of this range, many of the pieces are now made in Stoke-on-Trent, England factory.